Want to Start a Groundwork Trust in Your Community? The 2018 call for Letters of Interest from communities wishing to begin the process of applying for Groundwork USA program funding and technical assistance and to join the Groundwork Network is now closed. Groundwork USA anticipates that we will again be accepting Letters of Interest from interested communities in 2019. 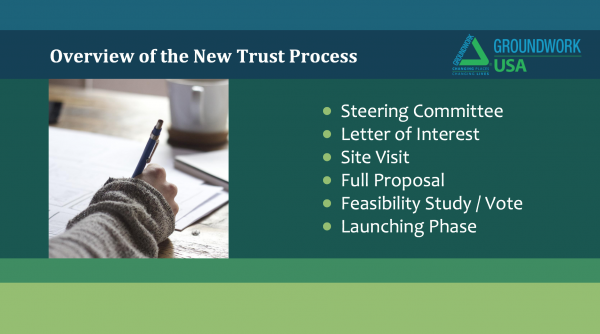 During and following the “Starting a Groundwork Trust in Your Community” webinar, we received great questions about the Request for Proposals and overall process for starting a Groundwork Trust. We are sharing these questions and answers below. If you have questions about the application process, please contact Stacey Moran, Program, Policy and Resource Manager at Groundwork USA (stacey@groundworkusa.org). use of the Groundwork USA name and identity and the national profile, reputation, and influence the Groundwork brand imparts. Though each Groundwork Trust is responsible for its own affairs, it is also responsible to act in the best interests of Groundwork USA and to manage its business to the highest possible standards. Those standards are outlined in the Groundwork USA Memorandum of Understanding which the Trust organizers and Board of Directors vote to accept when they established a new Groundwork Trust. Under the terms of the Membership Agreement, each Trust and the Groundwork USA national office are accountable to one another to fulfill the tenets of the Agreement and build the good name and reputation of Groundwork USA. Establishing a new Groundwork Trust is a multi-step competitive process led by Groundwork USA in consultation with the National Park Service Rivers, Trails and Conservation Assistance Program. The first step in the process is to learn about the Groundwork model and the work of our network of local Trusts nationwide. Discuss this opportunity with other stakeholders in your community to determine interest. If the Groundwork mission and approach is in line with your community’s needs and goals, and you think there may be interest in developing a Groundwork Trust, establish a steering committee of diverse stakeholders and submit a Letter of Interest to Groundwork USA. If selected, the steering committee works with Groundwork USA and NPS to evaluate how a Groundwork Trust could work for your community and to submit a full proposal for Groundwork USA Pilot Funding and Technical Assistance. Selected communities then work with Groundwork USA and NPS on an in-depth feasibility study. Upon completion, if the final decision is to establish the new Groundwork Trust and the local public and private sector match funding is committed, Groundwork USA and NPS provide seed funding and technical assistance to help launch the new Trust.